Chickens?!?! You have chickens? Why? Don’t they stink? Do you have a rooster? 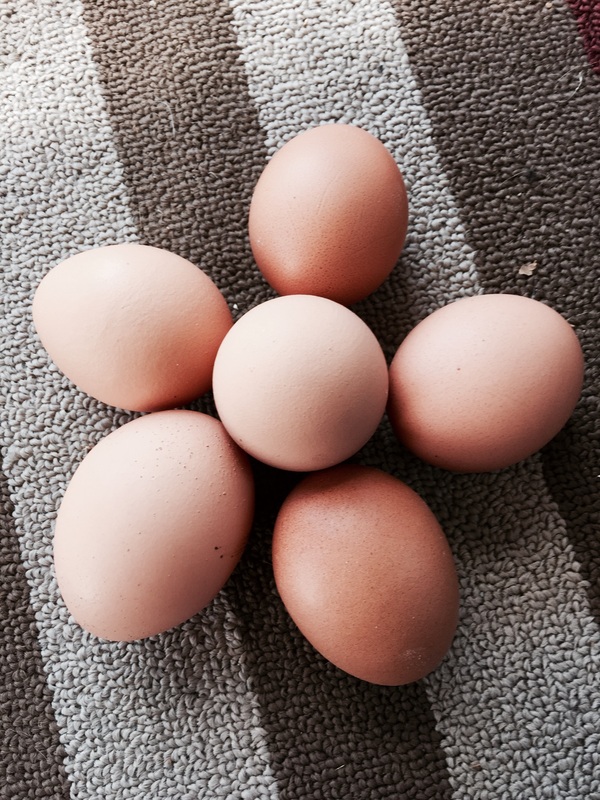 Hens can lay eggs without a rooster? Yes, many questions are asked when people find out about these ladies! 2 of my pretty ladies! 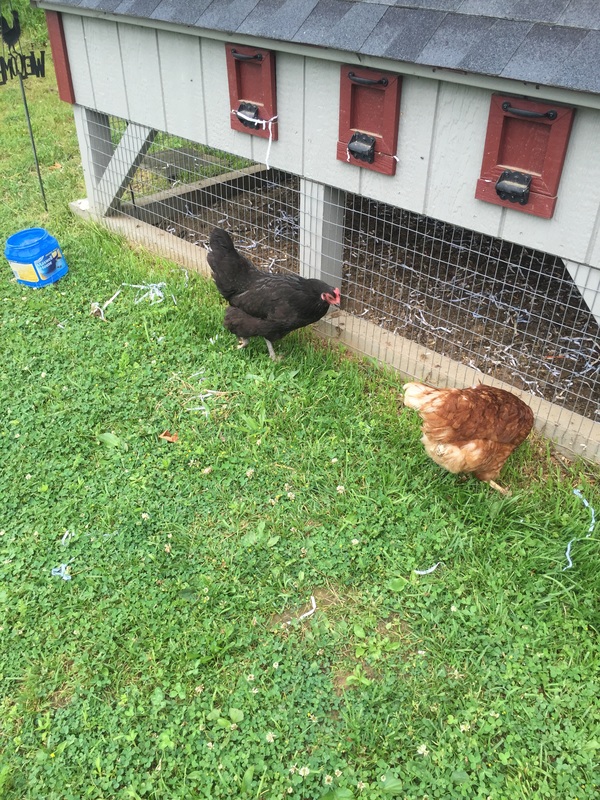 So, I have had lots of people ask my why I keep chickens. There are so many reasons why I do! I kind of consider them like pets, but also they complete the cycle. What cycle you ask?? Part of the having an amazing garden cycle! Here it goes! I feed chickens their feed, but also lots of yummy stuff leftover from the garden. They also gets lots of treats, like leftover spaghetti or Mac and cheese that the boy just couldn’t finish. Some of the yummy treats! 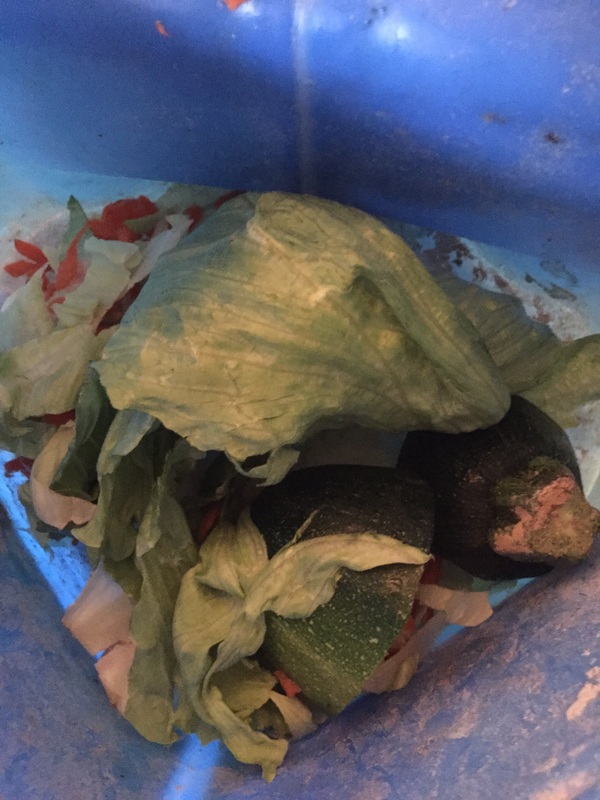 What is so great about the ladies getting the leftovers is that it keeps it out of the trash and I haven’t heard a chicken complain yet! They also produce some amazing manure that when composted, it turns your soil into super soil! It’s a win-win for the Llewellyn homestead! 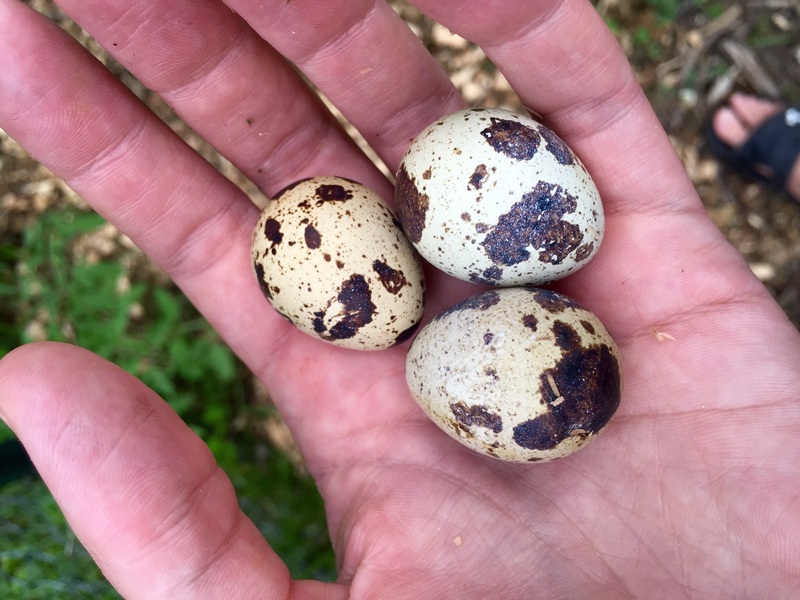 Also at the end of the day, I get about an egg a day from each lady! I consider that amazing! Especially considering how expensive eggs are right now! Overall, chicken keeping is a lot of work! However, I don’t mind doing any of this work! And, once you have some eggs from chickens that don’t live in a cage, you won’t go back! 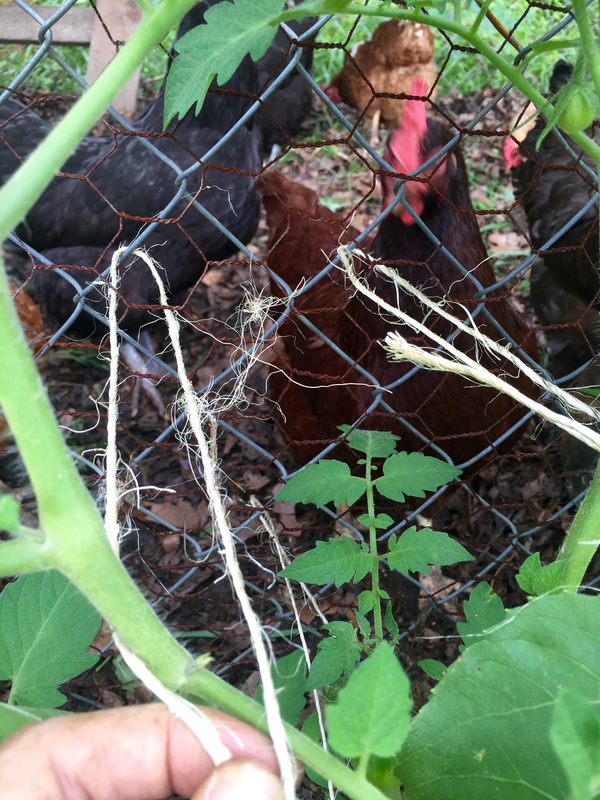 This morning I took a walk through the garden and visited the hens. We are definitely getting to the harvesting part of the year! 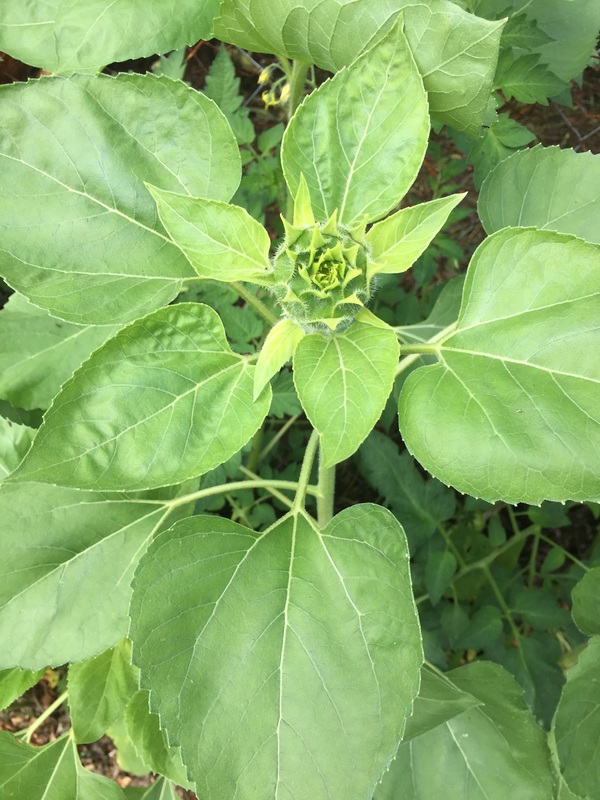 The sunflowers around the chicken coop are getting ready to bloom! These are just the extra sunflowers that the girls kicked out of their coop. I’m guessing that they are black oil sunflowers! 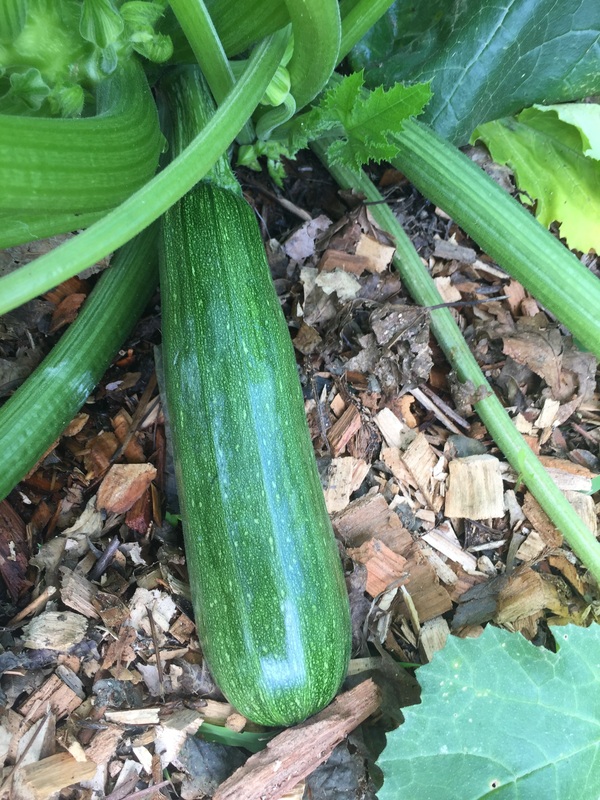 The zucchini is finally growing! I will be harvesting my this yumminess by the end of the week! 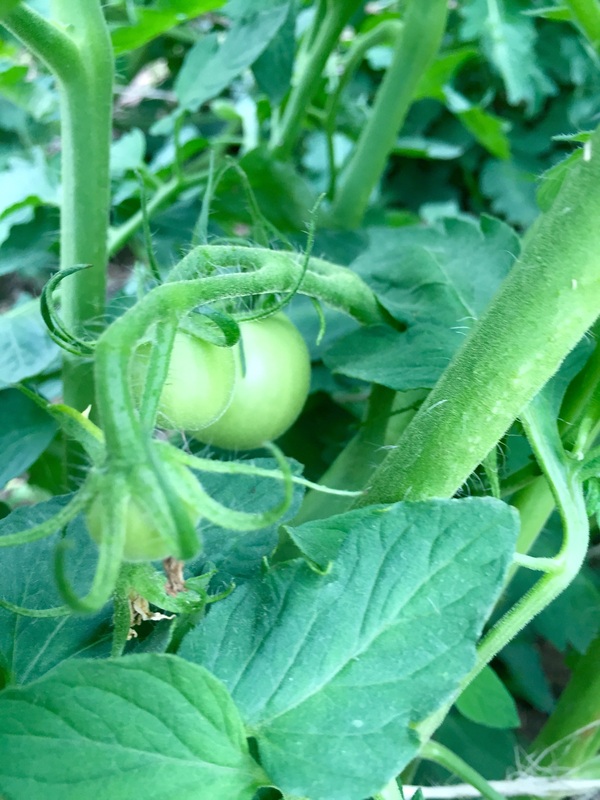 The tomatoes may still be green, but they are growing by the day! I can’t wait until I get to make a yummy tomato sandwich. The boys can’t wait until they get yummy spaghetti sauce. 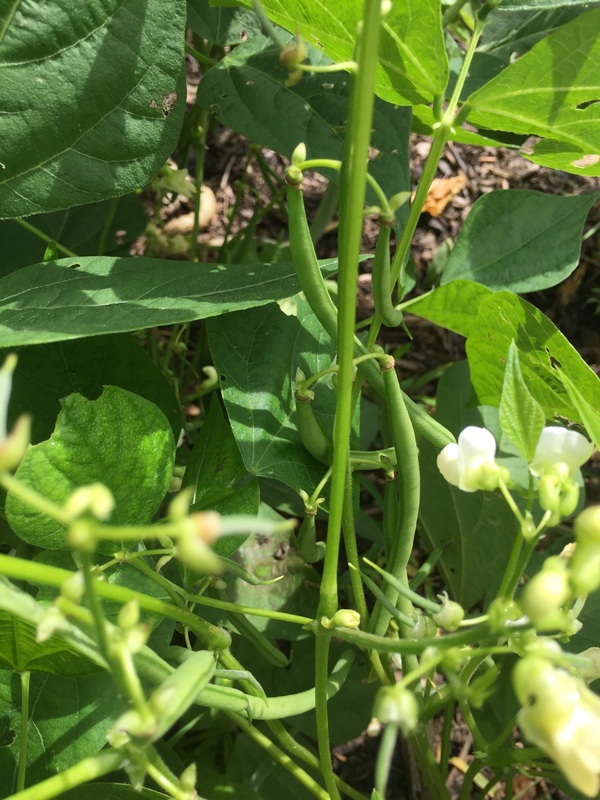 The green beans are well on their way to being harvested too! I’m hoping to have some potatoes too, so that I can make some green beans and potatoes! With everything blooming and harvesting starting, I’m going to start keeping track of all of the food harvested! Gardening is amazing!! Today I took a break from gardening, it was raining, and I spent some time getting rid of stuff. I feel like the less that I have to keep track of, the better. It’s not like I’m a fashion queen or anything, but I need work clothes (I’m a teacher), workout clothes, comfy clothes and crap clothes( because I get really dirty sometimes)! 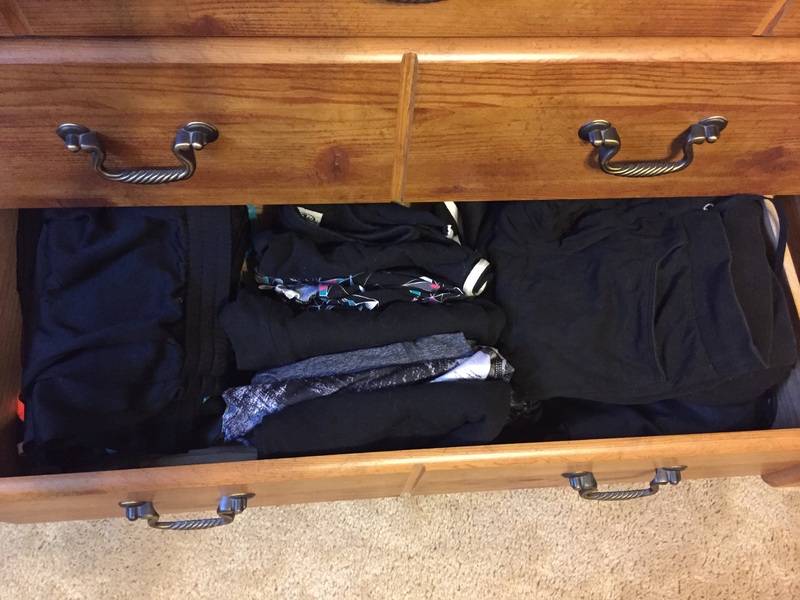 I continued to work on my drawers and clean out my workout clothes! Before, I was not so proud of the mess! But afterwards, it looks so neat! Overall, it took about an hour and it makes me feel good to have a little less mess! I think next week I will be working on a toy box in a certain boy’s room! 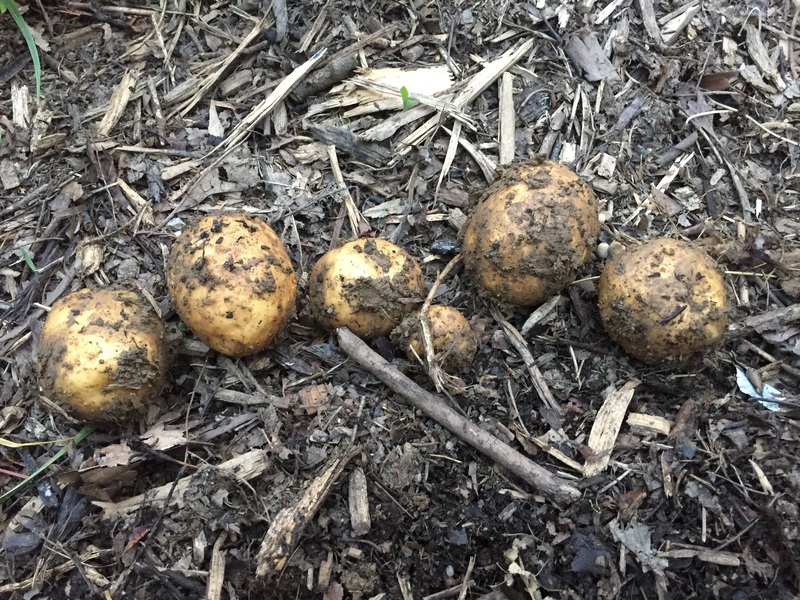 I recently had a couple of my potato plants die off earlier than the rest. It resulted in me getting some yummy potatoes earlier than expected! I posted a picture of those beauties on Facebook and everyone kept asking if I ate them yet. Well, I finally did! 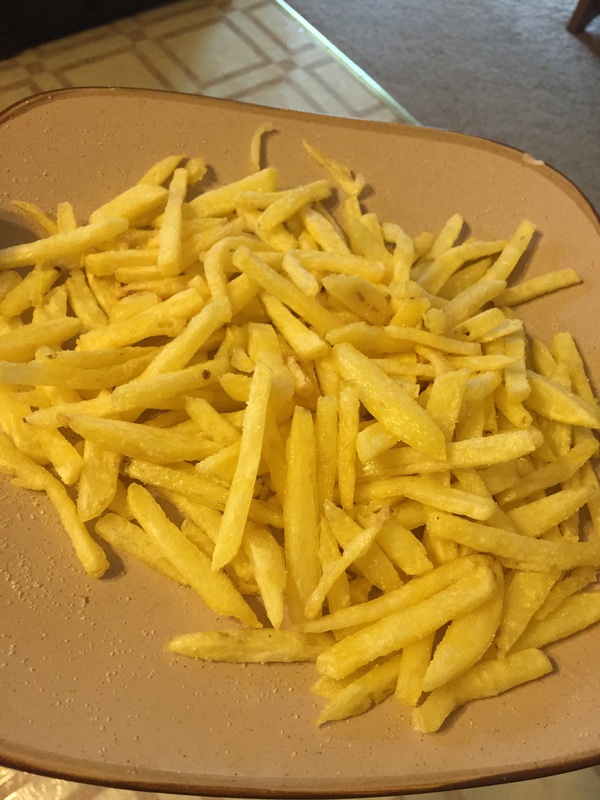 I followed the pioneer woman’s recipe for making fries and they turned out perfectly! Our family of 3 were shocked at how much yummier that they taste compared to take out fries! Basically in her recipe, you cut up the fries and rinse in cold water. Then, you let them soak in water until dinner time. You fry them once in oil and then fry them again. I know, not the best diet choice! But, moderation is key! We paired this meal up with some broccoli from the garden and locally raised beef burgers. Yummy! 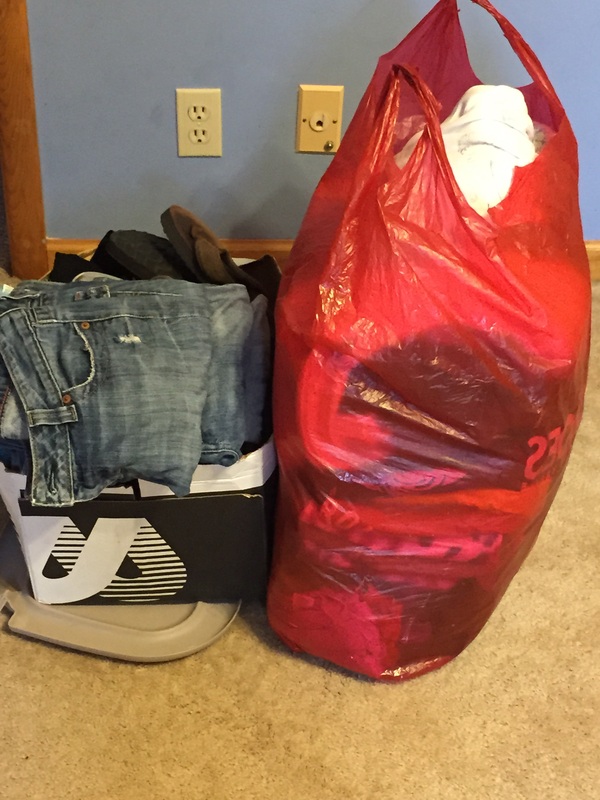 Now I’m off to work on clearing out some stuff from the closet! 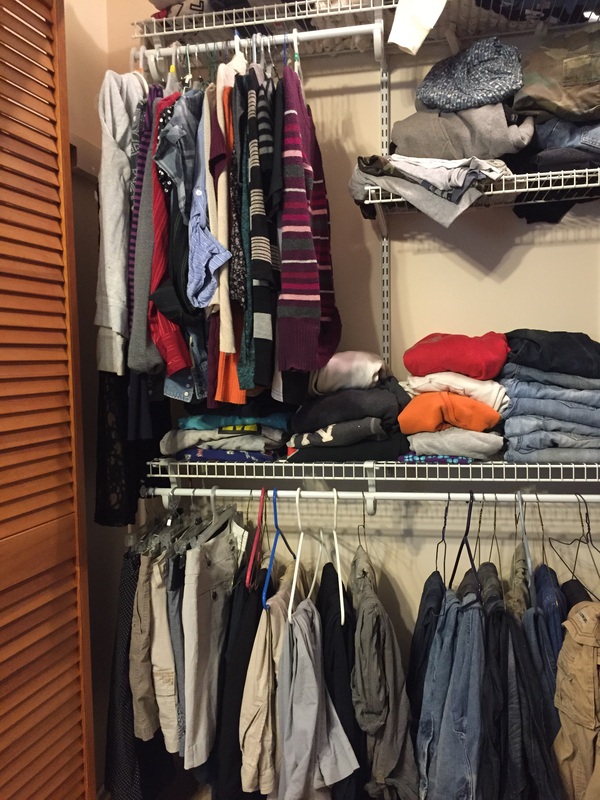 Doing our best to living a little more minimalisticly! 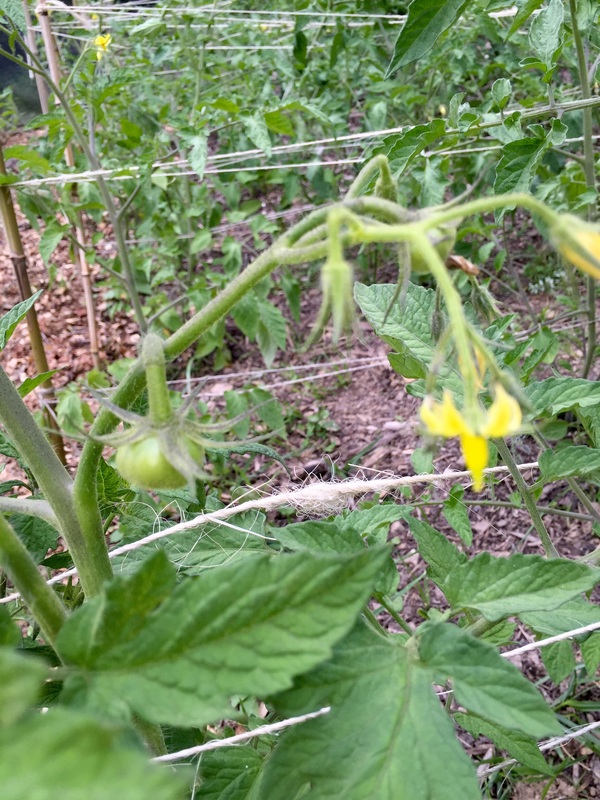 I have dubbed this year,” the year of the tomato!” because we had over 50 tomato plants come up all by themselves! So, I put some in the garden, some in the raised beds, along the fence and by the chickens. That’s a lot of planting, but I have some good supervisors when securing the tomatoes to their run! Hens making sure the job is done right. 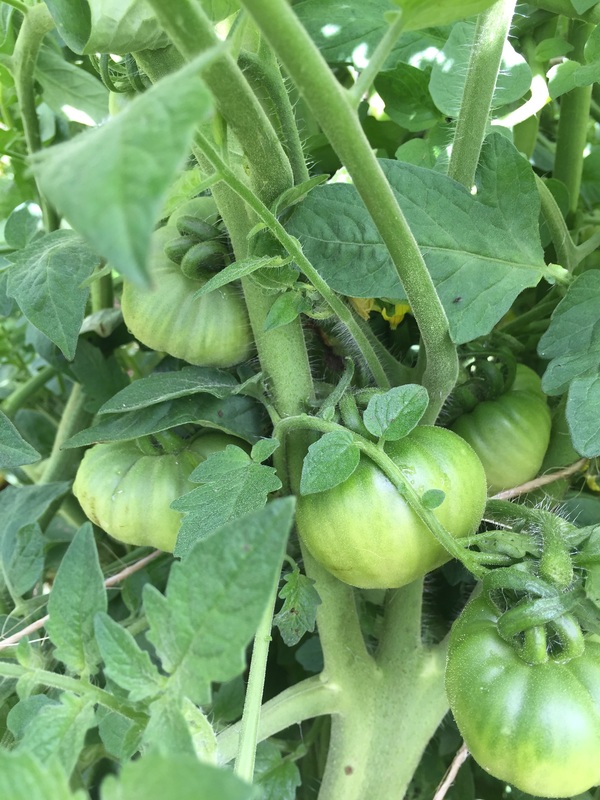 I planted lots of heirloom tomatoes this year. 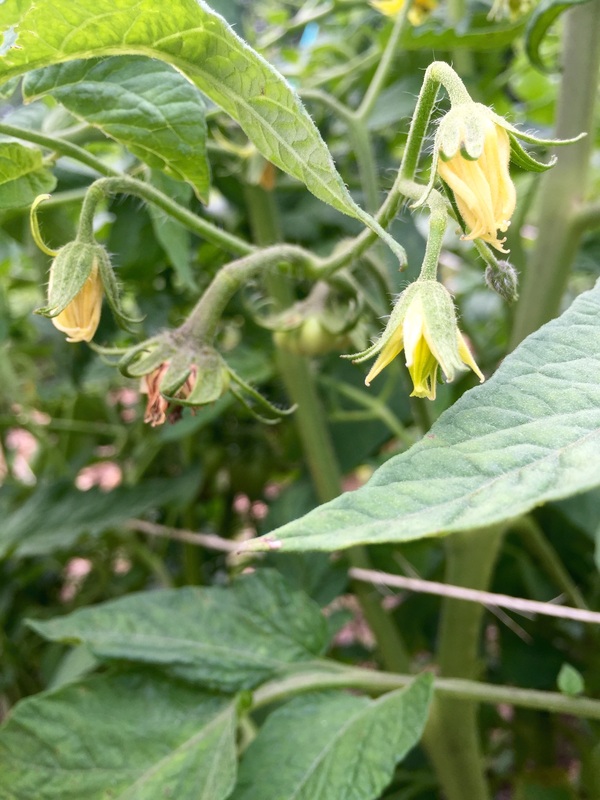 I’m intrigued by a strange looking variety, which is the brandywine tomato. The mr. Thought they were peppers! There is a striking resemblance! 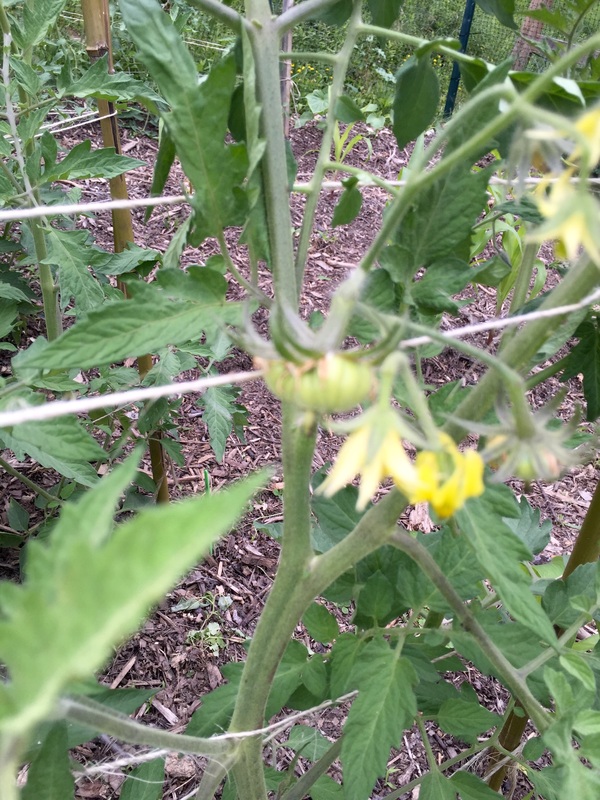 We are getting so close to harvesting some of the fruits of our labor! 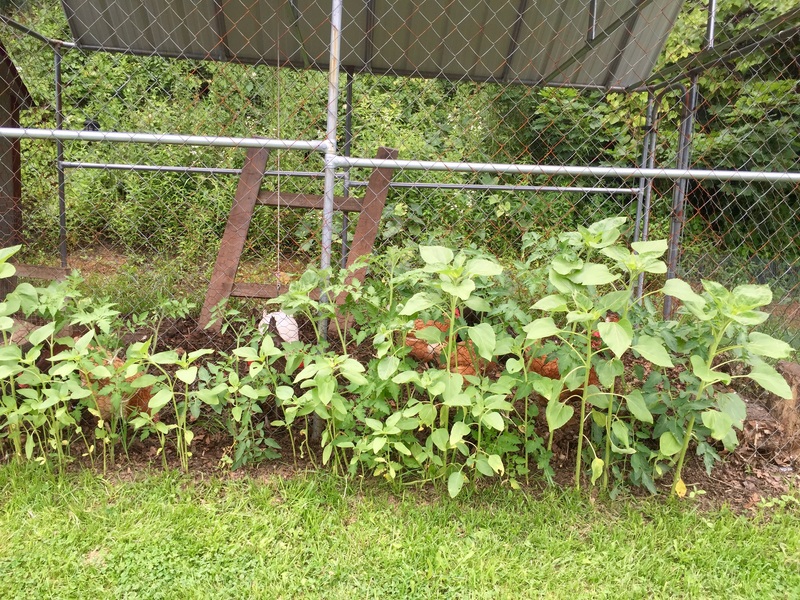 The bush green beans will be ready soon and the zucchini are growing by the minute! I’m so excited for creating this little garden oasis in the middle of town! This has been one of the most wet summers that I can remember! I haven’t had to water the gardens in over a month because it rains so frequently! Yesterday alone it rained over 3 inches! That’s a little too much! 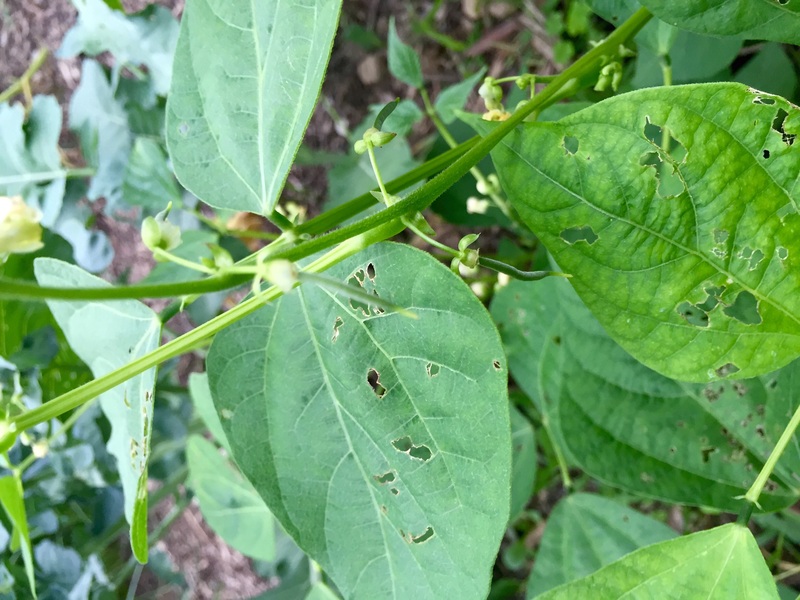 So, weeds were becoming a problem! 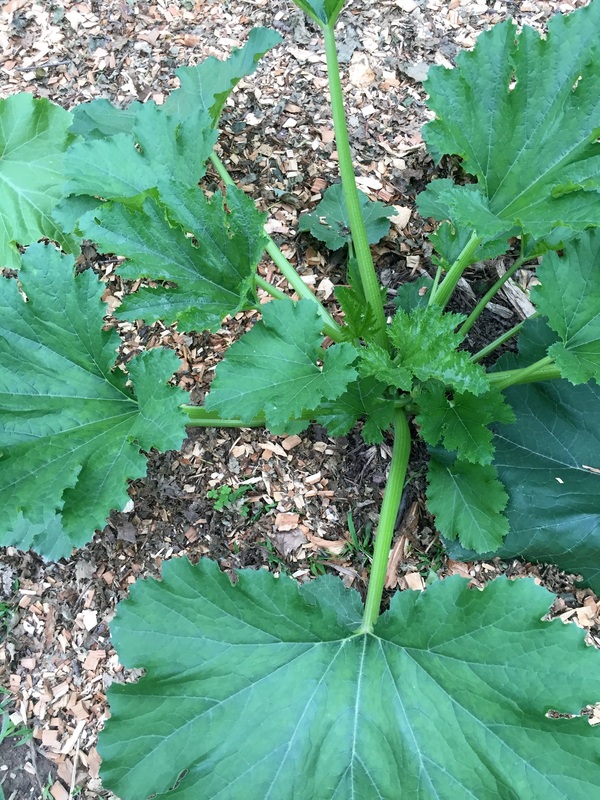 While I don’t mind pulling some weeds, it’s almost impossible to keep up with them. So, I figured I would try using the mulching method. So, I begged for some wood chips from our local tree cutting service and I received them! Thanks again! Our load of wood chips! 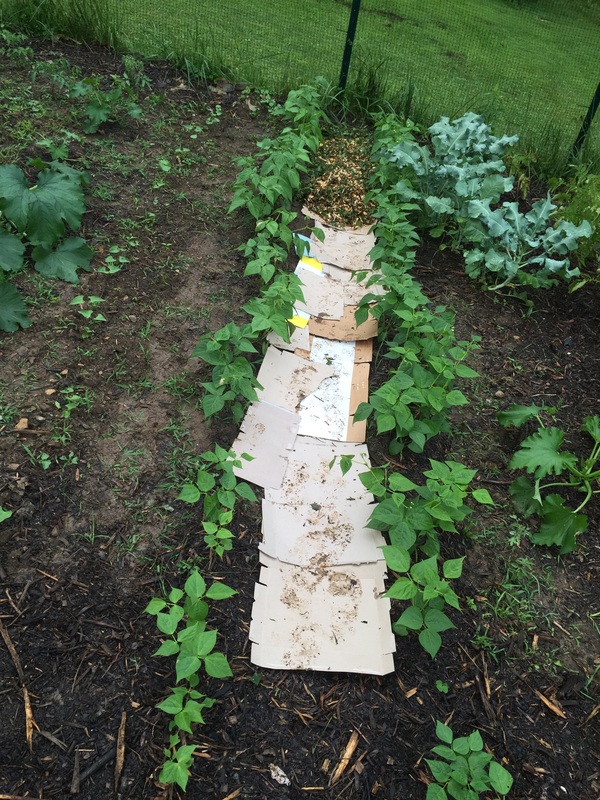 First, I started by laying down some cardboard between my green bean rows. It wasn’t just weeds growing between these rows, but some crazy invasive grass. It was pure evil! Cardboard first before the mulch! 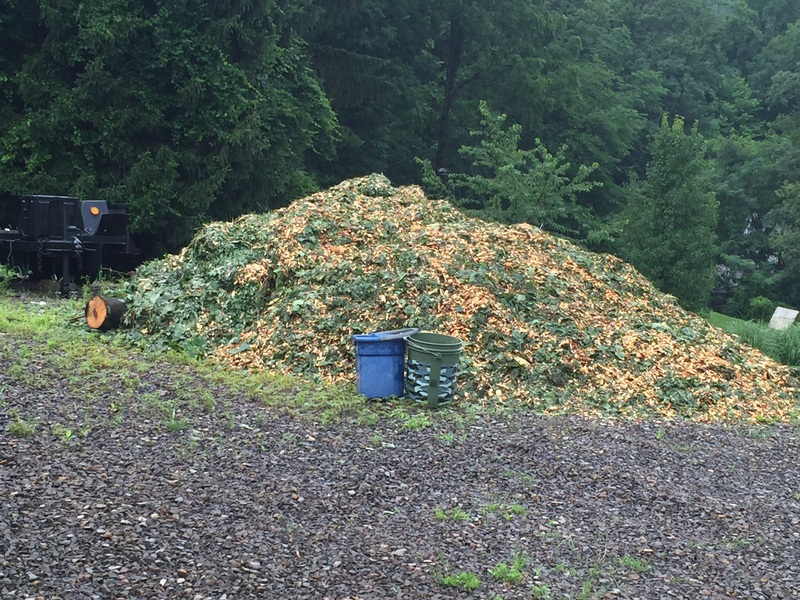 Then, I loaded and unloaded bucket after bucket of this nicely chopped maple mulch. It must have been a freshly cut tree because the leaves were still green! Doesn’t it look so nice?!?! And it’s much easier to walk through since it is always muddy here! 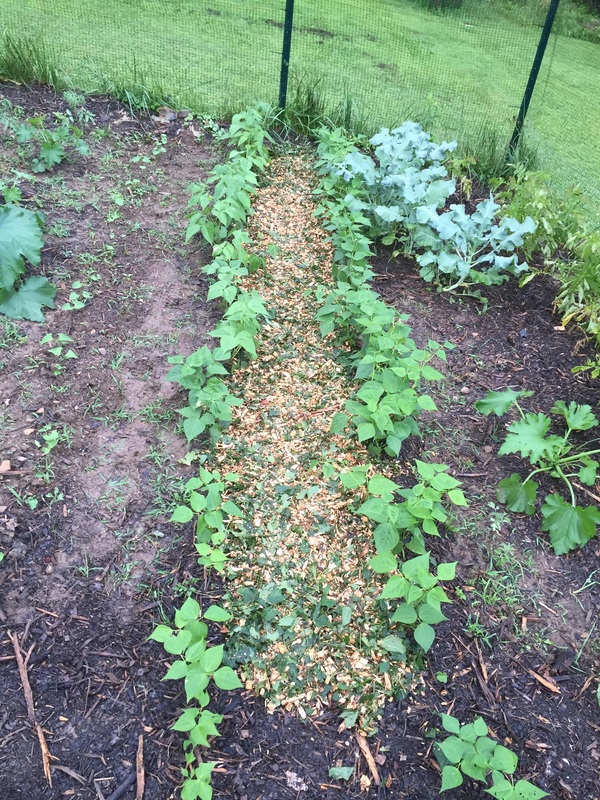 And after I worked on the green bean rows, I put more mulch down on the walkway through the garden. It is so nice to not see weeds everywhere for now! And I like not using plastic weed wrap because I don’t like dealing with any plastic! The walkway, minus the weeds. 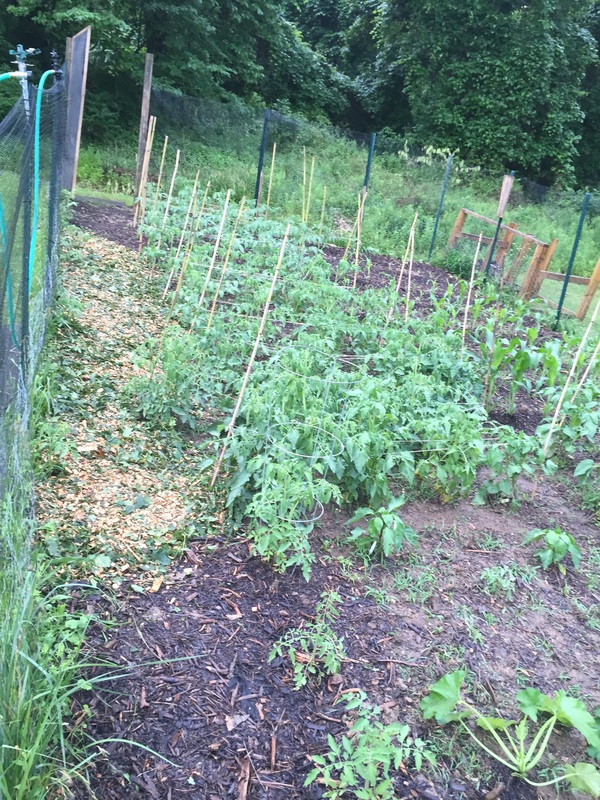 So far the weeds have been much better and it helps to retain moisture too! I will continue to update on the use of the mulch, but I know that I definitely need to build up more topsoil too! And the best part is that there is so much more mulch!